This is the press statement by the Nigerian Police Force, Imo state command. different locations. 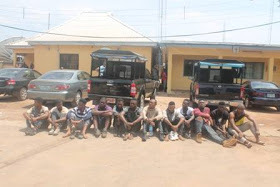 Thirty-one (31) suspected cultists were later arrested. 0 Response to "Cultists Caught During Initiation Activity At A Secondary School In Imo (Photo)"